Lavish is a great word, isn’t it? The word is fun to say and its meaning goes beyond generous. We can increase vocabulary and share God’s love with our children using this wonderful word and the Bible verse that uses it. If we put the raisins in the glass of soda, will they sink or float? It is a bit tricky to guess. The raisins are heavier than the soda, but they are also shaped like little boats. Let’s give it a try and see what happens. They sink and float; the raisins do both! When we sin, we fall away from God, just as the raisins sink to the bottom of the glass. Sometimes we get a sinking feeling inside because we know we have done something wrong. If you watch a raisin on the bottom, you will see that tiny bubbles collect around it. These bubbles form a sort of life jacket around the raisin and cause it to float to the top. When we sin and fall away, God reaches down with mercy and forgiveness and brings us back to Him. 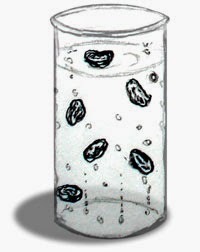 If you watch a raisin at the top you will notice that the bubbles pop and sooner or later the raisin sinks to the bottom of the glass. When God forgives us He takes away our sin, but then we sin again, and again, and again. Each time we sin we fall away from God and each time God forgives and restores us to Him, again, and again, and again. God loves us in a lavish way. He loves us in a way we do not deserve. He loves us this way because He is a generous God. This lavish love is called unconditional love. It means God loves us, no matter what. We cannot do anything to make Him stop loving us. We cannot do anything to make Him love us more. I love this, Kim! Can't wait to use this to teach Aiden, and SUPER excited to see what you come up with in the future :) Sharing this new blog with our family email newsletter subscribers this month too! Thank you, Branson. I hope to post more integrating the faith messages as well as parenting tips. I have set up the permalink feature if you want to link to a specific post. Blessings!